The Jigsaw – the one saw to rule them all! If you don’t have a jigsaw yet, now is the best time to buy one. The jigsaw is one of the most versatile power saws that you can have due to the variety of cuts that they can make. With one of the best jigsaws, you can make everything from long straight cuts to beveled and curved, from the wood of varying thickness and density to plastic, steel, fiberglass, ceramic tiles, drywall, and more; as long as you have the right blade on your saw. When it comes to portable power tools, jigsaws are the only tool that can effectively cut curves. This makes them a must-have for any woodworker who wants to get the job done faster than with a hand-held coping saw. Plus, you might think you need a table saw or miter saw to make bevel cuts, but the fact that most today’s jigsaws can be angled up to 45 degrees for bevel cuts. Simply put, with a jigsaw, you can basically cut anywhere, in any direction, and on almost any materials you have. If you’re looking to buy a jigsaw, here are our top picks of the best jigsaws on the market we think you should buy. Jigsaws are a powerful tool to have in your workshop or your tool bag on the job site. Especially when the jigsaw is cordless and you have the freedom to do what you wish and not be tied down with a cord. Cordless jigsaws are a flexible tool that allows for quick cuts to break down material, coping cuts, circular, convex, and concave cuts, and much more! With a variety of brands, styles, and battery platforms, picking the right cordless jigsaw can be a tricky decision. These are our top picks and reviews of the best cordless jigsaws available on the market for people to buy. 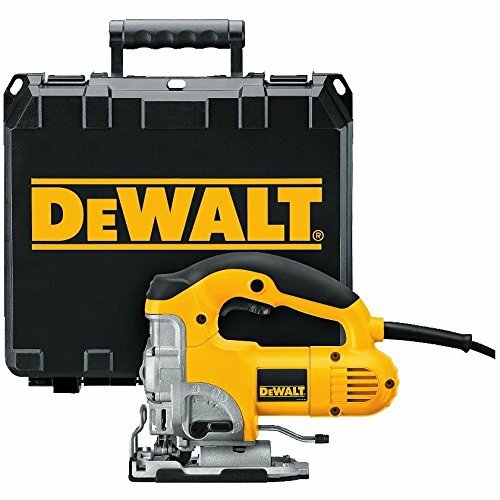 The DEWALT DCS331 20V Cordless Jigsaw is the best jigsaw on the market when it comes to the combination of performance, durability, ergonomics and comfort, and price. 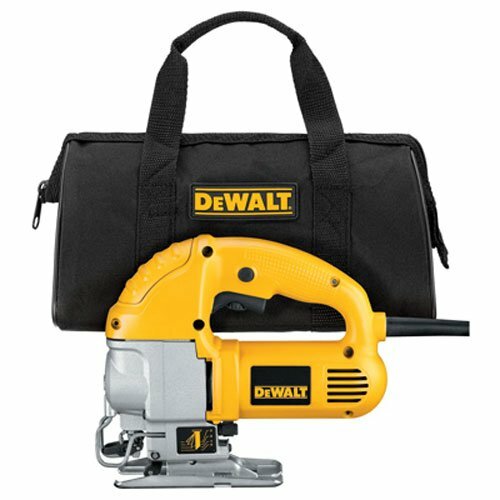 This jigsaw has been on the market since 2012 (and Dewalt has released an upgrade – the DCS334 cordless Jigsaw with brushless motor), but it’s still the gold standard for cordless jigsaws and is the tool of choice for contractors who require long run time, powerful applications and lightweight tools. The DEWALT DCS331 offers a jigsaw with all the power you need on the toughest jobs with the 20V Max battery platform that lasts longer and charges quickly. 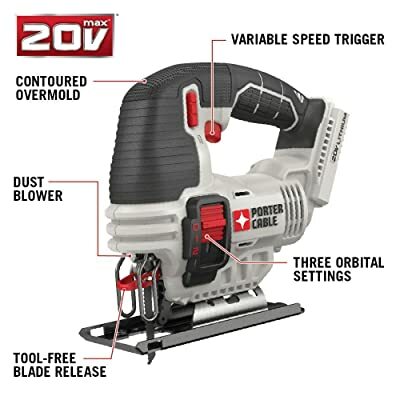 We tested this cordless jigsaw cutting a variety of materials including plywood, poplar trim, birch stair parts and other various trim materials. In each situation, the DCS331 provided plenty of power and never showed signs of fatigue. The most impressive thing about this cordless jigsaw is probably the runtime. This jigsaw comes equipped with a 3.0Ah/20-Volt Li-ion battery that has LED fuel gauge indicator lights. You can use the saw all day on just a single charge. With the LED fuel gauge indicator lights, you can quickly find out how much run time is left on the battery. Best of all, this jigsaw will work with all the 20V batteries from Dewalt. The Dewalt DCS331 outperforms other best cordless jigsaws on the market not only because of its superior performance and extended runtime, but also because of its super handy design with features such as keyless blade change. The keyless blade change lever, which is all metal, works very well and allows you to change the blade very fast and simple. Featuring 4-position orbital action for control of both cut quality and cut speed, this Dewalt jigsaw also has an adjustable blower to keep the line of cut clear of chips and debris for more accurate cuts. Engineered to accept T-shank blades, the saw features an all-metal keyless shoe bevel with detents at 0 Degree, 15 Degree, 30 Degree and 45 Degree which are the most common angles used by professionals. Although many parts are made of metal, the saw is very comfortable to use due to its fine balance and weight. Many jigsaws are too light in weight that makes them vibrate throughout the cut. This saw has very little vibration and walks smooth through both metal and wood. 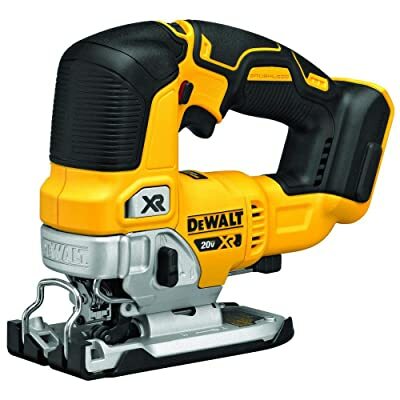 Overall, the DEWALT DCS331 20-Volt MAX Li-Ion Jigsaw is a heavy-duty, powerful cordless jigsaw. It’s one of the best jigsaws available that not only you but most professional woodworkers and contractors want to have in the toolbox. Is the new DEWALT DCS334 XR Brushless Jigsaw worth an upgrade? For those of you wondering, the XR stands for “extended runtime,” and is designed to deliver advanced electronics, extended run-time and faster application speeds for extreme performance. Compared to the DCS331 model, the new DEWALT DCS334 XR Brushless Jigsaw is smaller, lighter, faster, has a lowered motor position, and improved the blade clamp. And with a brushless motor, it is also quieter, more powerful and much smoother to operate. After using both saws it’s obvious to us, that the new DCS334 will provide even more power, more accuracy, more runtime, and less vibration. It also comes with a bight LED light that was missed in the DCS331 model for more precise cuts and better control. 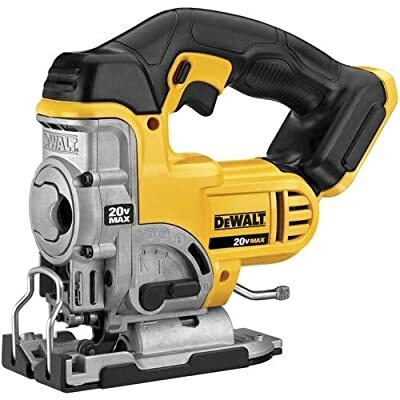 But the DEWALT DCS334 XR Brushless Jigsaw is more expensive, of course. Bosch makes some of the best jigsaws on the market, and the Bosch JS120BN 12-Volt Max Cordless Jigsaw is one of their most popular cordless jigsaws. This saw has a barrel grip design that is very easy to handle and control through complex cuts. Like many jigsaws, this Bosch cordless jigsaw also has an adjustable orbital action to allow for precise or more aggressive cuts. With such a light tool, the JS120 has a great cut capacity at 2-3/4″ in Wood and 3/ 8 inches in Steel with solid power and very little vibration. Its counterbalanced plunge mechanism delivers smooth blade strokes. 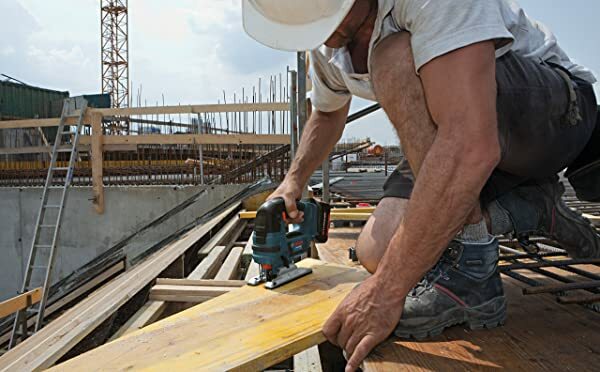 Bosch equipped this cordless jigsaw with its industry-leading Electronic Motor Protection (EMP) and Electronic Cell Protection (ECP) technology to prevent motor overload and battery overheating. The JS120 also has T-shank blades allow tool-free swaps (does not accept U-shank blades), and a multi-directional clamp holds the blade securely while you work, as well as an LED light that lights the cutting surface. The saw features a variable-speed motor that supplies 1,500 to 2,800 strokes per minute. It has three blade motion settings that handle a variety of cutting jobs, including making bevel cuts at angles of up to 45 degrees. The tool’s die-cast aluminum footplate and no-mar plastic overshoe slide smoothly and protect your materials. With such handy features plus an ergonomic barrel grip design and a compact size (just 9.4 inches long and only 3.0 Lbs), the Bosch JS120BN Cordless Jigsaw is one of the best jigsaws to handle the cuts in tight spaces or for more finesse cuts. If you are a contractor or cabinet installer that is in tight spaces from time to time, a jigsaw with barrel grip design is extremely comfortable for those tasks. 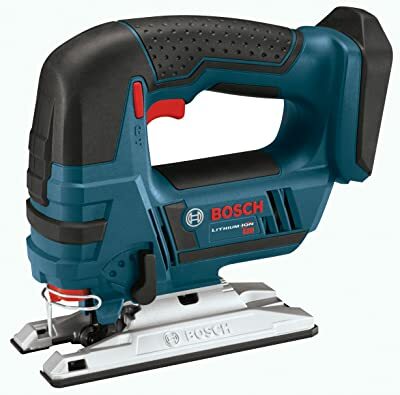 But Bosch also offers the 18-Volt cordless jigsaw – the Bosch JSH180B 18-Volt Lithium-Ion Cordless Jig Saw. The obvious difference between these two Bosch jigsaws is the difference in the battery platform. The larger JSH180B is 18-volt while the smaller JS120BN is 12-volt. This is a pretty significant difference. The 18-volt jigsaw will have longer run-time, more power, but comes in a larger more heavy unit. While the 12-volt jigsaw will provide a shorter run-time, less power, it is being delivered in a smaller, more compact size. The 18-volt unit will be much more suited to heavy-duty applications such as thicker material, metal, larger cutting jobs, etc. While the 12-volt unit will be perfect for the smaller applications that require more finesse such as cabinet cut-outs, getting in tight corners, etc. The 12-volt jigsaw has the barrel style grip, which is great for the more finesse cuts and also being upside down. The 18-volt jigsaw has a traditional jigsaw style grip, which allows the user excellent control and allows him/her to apply downward and forward pressure to complete the cut with comfort. In conclusion, these two Bosch cordless jigsaws are quality, compact jigsaws. Both are definitely the best jigsaws you can buy. The larger 18-volt unit is best for people that complete these heavier tasks more often. The smaller 12-volt unit is best for more precise work or working in a tight space, or for doing DIY projects around the house. One of the most powerful cordless jigsaws money can buy is the Makita XVJ02Z 18-Volt LXT Brushless Cordless Jigsaw. Featuring a brushless motor with the variable 6-speed control dial (800-3,500 SPM), this saw delivers plenty of power for tough jobs. We can tell that this cordless jigsaw is as powerful as most corded jigsaws available on the market. Some corded units may have a little more power, but with this cordless unit you have enough power for the toughest jobs without having a cord in the way. With a powerful brushless motor and 3 orbital settings plus straight cutting, the XVJ02Z has a great cut capacity at 5-5/16 in. for Wood and 3/8 in. for steel. The brushless motor is designed to remove carbon brushes from the motor, allowing the saw to run cooler and use less energy. Makita 18-volt LXT Li-ion battery platform is engineered to deliver consistent power and run time in extreme temperatures, even in winter (-4°F/-20°C). 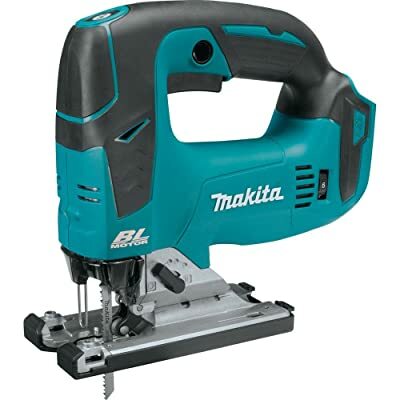 It also features Makita’s advanced charging technology, and each battery has sixteen contact terminals to maintain a constant connection with the tool to help prevent power loss or fluctuation, even during high-vibration applications. Other convenience features include a tool-less blade change system that allows for faster blade installation and removal, a large 2-finger variable speed trigger with lock-on button. The design is highly durable, with a machined aluminum base and dual-frontal LEDs to illuminate your work area. Overall, the Makita XVJ02Z 18-Volt LXT Brushless Cordless Jigsaw is the best jigsaw for those looking for a powerful jigsaw with the convenience of cordless power. Of all the cordless jigsaws we’ve reviewed, this is the most powerful unit. One of the cheapest cordless jigsaws you can buy is the Porter-Cable PCC650B 20-Volt Cordless Jigsaw. This saw features 3 orbital settings which can easily adjust the cut aggressiveness across a wide range of applications. It also features a variable speed trigger which provides control for clean and accurate cuts. The integrated dust blower clears debris for better viability. It also has a tool-free blade release that allows for quick and easy blade changes, along with a beveling shoe that provides the ability to cut 0 to 45-degree bevel cuts. This Porter-Cable jigsaw has all the features that we expected from the best jigsaw, but at a half the price. The fact that this unit is the weakest cordless jigsaw in the list. With a maximum speed of 2,500 strokes per minute, it’s best suited for light-duty applications like remodeling your house or outdoor area. If you’re a woodworking hobbyist, or weekend DIYer, this is a great tool. It is quite powerful for a battery powered jigsaw, and a charged battery lasts plenty long enough, assuming normal kinds of usage. It is also lightweight, well balanced and easy to control. And for the price under $100, this is the best cordless jigsaw you can buy. A huge plus to a cordless jig saw is there isn’t a cord to get in the way. But a negative is the run time and they tend to be heavier than a corded jig saw. A corded jig saw tend to have more power and a slimmer body than a cordless. If you’re looking for a corded jig saw, these are our top picks of the best corded jigsaws available that we think are worth your money. When it comes to corded jigsaws, Bosch jigsaws are the best on the market. 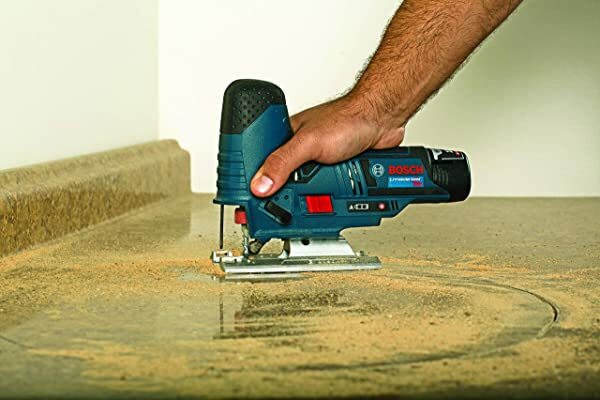 The new Bosch JS572EBK Barrel-Grip Jigsaw is an update of the popular JS470EB Jigsaw – which was rated as the best jigsaw on the market for many years. The new JS572EBK took all the great features of the JS470EB and added some additional great features and improved on others for a jigsaw that’s hard to compare to others. The new Precision Control II Double-Roller System is at the heart of the redesign. Adding an additional roller and placing it as close to the workpiece as possible they’ve been able to add much more lateral stability to the blade. The result is the ability to cut tight curves while maintaining a perpendicular cut face. Sounds easy but this is one of the things that most jigsaws struggle with. 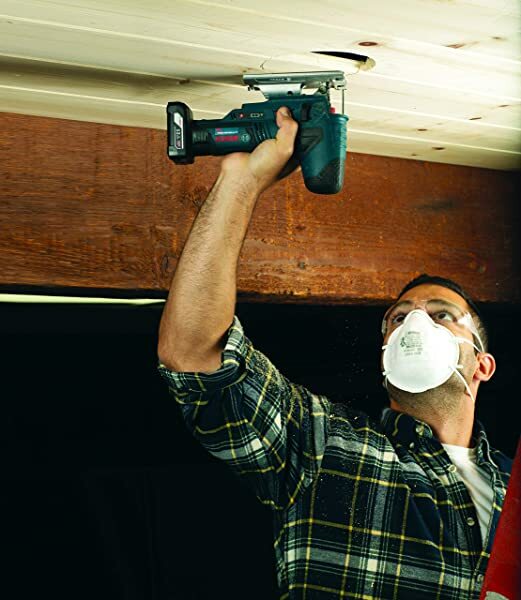 Thanks to this innovative system, the Bosch JS572EBK has the highest cut accuracy in its class. Bosch didn’t skimp on power with the JS572EBK – its 7.2 amp motor makes it one of the most powerful barrel-grip style jigsaws. Yet despite its heavy-hitting motor, Bosch has trimmed and toned it in other areas to make it one of the lighter jigsaws in their lineup, weighing only 4.9 lbs. The aluminum gearbox and magnesium footplate are part of that lightweight formula, yet sacrifice nothing in terms of strength. Having a LED light on a jigsaw isn’t new, but Bosch really ramped things up with a very simple, yet innovative feature. The Bosch JS572EBK jigsaw includes a switch that allows you to turn the LED on or off, regardless of whether the motor or trigger are engaged. While this may sound like a minor detail, we think it’s incredibly innovative and we’d love to see it used on other power tools! Overall, we tested and reviewed many Bosch power tools and every time we appreciated their robust quality and durability. 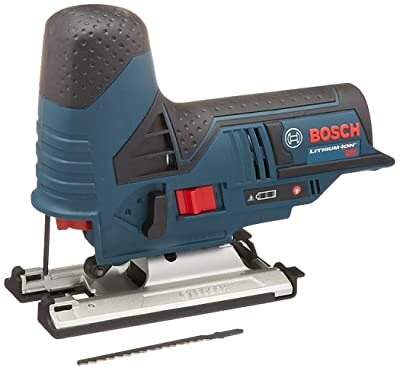 The Bosch JS572EBK Barrel-Grip Jig Saw is a top quality power tool that offers precision and power for any task from residential to commercial construction. This is one of the best jigsaws on the market and it’s is well worth your consideration. 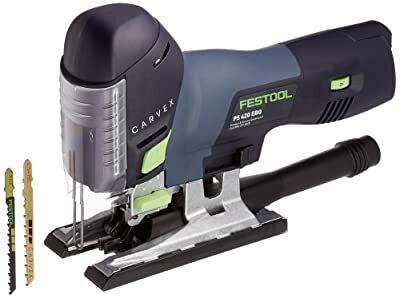 When it comes to corded jigsaws, the only other jigsaw that is on a par with the Bosch jigsaw in terms of quality is the Festool 561593 Carvex PS 420 EBQ Jigsaw. This is the newest jigsaw in the Festool jigsaw lineup to date with a new blade guide system and more powerful motor than the older model. With max speed up to 3800 strokes per minute, the Carvex PS 420 EBQ is the most powerful unit of all the jigsaws we reviewed. Everything on the Festool Carvex 420 EBQ Jigsaw seems to be designed specifically for professional woodworkers and cabinet makers. The low-profile of this unit is built with Festool’s advanced motor technology to provide control and comfortable use with very little vibration. The saw feels solid and is easy to maneuver around. We’re so familiar to using a jigsaw with a variable speed trigger. With the Carvex jigsaw, you just push a button forward that is located on the front of the tool and it is on. Designed for the lefty or righty. There is a separate dial to control the speed. For those who hate dragging around an extension cord or fighting with a short cord, the Festool comes with a nice long cord to eliminate this problem. The cord can also be flipped up 90 degrees for greater clearance in tight spots. As you would expect with Festool’s power tools, the Carvex PS 420 EBQ Jigsaw does have a dust collection port and works great with their vacuum or other popular shop vacuums. If you’re a woodworking shop owner and are seeking for a jigsaw with the most efficient dust collection system, this might be the best jigsaw you can buy. Finally, the Festool Carvex PS 420 EBQ Jigsaw has a brushless motor. The motor produces a speed of 1500-3,800 SPM and uses a T-Shank blade. As being said, this is the most powerful jig saw we’ve reviewed. The blade guidance system let you insert and reject the blade very easy and fast. The blade can be guided in three ways with a new lower guide that can be adjusted to ‘kiss’ the blade. A powerful hammer guide contained within the body of the machine ensures accuracy. Combined with a choice of four pendulum stroke actions and speed selection, and 4 high intensity LED lights to help light up your work area, you can be assured of smooth, precise cutting action, designed to work hard in a range of materials with the right choice of blade. Overall, the Festool 561593 Carvex PS 420 EBQ Jigsaw is on the expensive side. But it’s a great tool to have in your tool box. It’s a top quality jigsaw with a powerful cutting stroke which is driven from the newest Festool brushless motor, it is also compact in design and one of the lightest on the market at only 4.2 pounds. For the price under $100, the DEWALT DW317K 5.5 Amp Top Handle Jig Saw is the best jigsaw you can buy. Durable, user-friendly, compact, and quick saw is what we call this one. This is a great tool that offers enough power to cut through hard materials from thin-gauge metals to plastics to hardwoods. It is ideal for any task from DIY projects to construction sites. If you’re in the market for an affordable corded jigsaw this one should be on your short list! The DEWALT DW317K comes with a 5.5 Amp motor. Its newer upgrade is the DW331K jigsaw with a 6.5 Amp motor which provides more power to cut through harder materials. The DW317K has an all-metal gear housing stands up to abuse on the toughest job sites. An intuitive, keyless blade change means less downtime and more productivity. Four-position orbital action and variable speeds from 0 to 3,100 strokes per minute make it easy to adjust the tool’s speed and performance to a wide variety of sawing tasks. Small but strong, this Dewalt jig saw is a workhorse with convenient features you will not be disappointed. This is one of the best jigsaws on the market that offers powerful power, great control, and easy blade replacement. And for its reasonable price, this saw offers an excellent value. 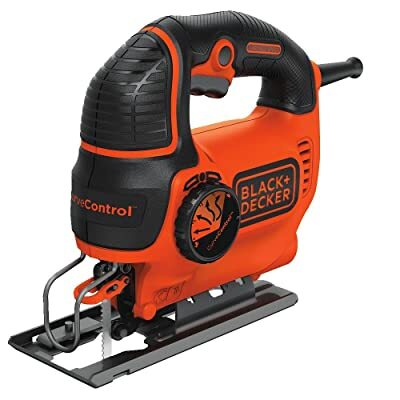 One of the most economical corded jigsaws on the market is the BLACK+DECKER BDEJS600C 5-Amp Jig Saw. This saw features Curve Control technology, allowing you to adjust the saw’s Orbit in 1 of 4 customized settings to help complete your specific project. The 5 Amp variable-speed motor generates up to 3,000 SPM of cutting power. The adjustment shoe is adjustable and can make bevel cuts of 22.5 to 45 degrees both left and right. You’ll see that the shoe is made from heavy gauge metal, which is nice. No tools are needed to install the blades. You can use either U or T shanks with the saw. We’ve found this cheap jigsaw offers pretty accurate cuts and precise control, especially at low speeds for wood cutting. It’s very easy to make curved cuts as this saw features curve control. The overall quality is very good and we think it’s really great for the price. So if there is no reason for you to spend a bunch more money on a top quality jigsaw because you only do some simple DIY projects weekend or build things just for fun, this Black+Decker is the best jigsaw for you. Most manufacturers now offer cordless jigsaws. Although historically these tools are not nearly as powerful as their corded counterparts, recent improvements in battery technology have reduced the gap. The best cordless jigsaws now are powerful enough to do most tough jobs, whether it’s on the jobsite or in the workshop. However, if you are a professional woodworker and are buying a jigsaw for daily use, in your workshop, then the best jigsaw for you is still a corded unit, as it will handle all stock and all cutting duties with ease. As being said, a huge negative to a cordless jigsaw is runtime and they tend to be heavier than a corded jigsaw. A corded jigsaw also tends to have more power and a slimmer body than a cordless. We prefer the cordless jigsaw for quick cuts and don’t have to worry about finding an extension cord to plug into. Cordless jigsaws are extremely versatile tools. There’s also a danger of the cord getting cut with this tool. When working on a profile on a long board, the cord of a corded jigsaw could be stretched to its limit, ruining the profile. Most jigsaws will feature variable speeds. While this isn’t always necessary when woodworking, it is especially useful if the jigsaw is used to cut metals, where slower speeds make for better cutting. Slower speeds can also be helpful when making intricate curved cuts. Although it may not be used often, variable speed is a feature that is well worth the extra cost for most people. Orbital action refers to the blade action. A standard action jigsaw moves the blade up and down in a straight line. An orbital action jigsaw will allow the user to press a switch and the blade will not only move up and down, but front to back as well. This will cut through wood a lot faster and smoother than just the up and down motion. Most jigsaws will cut up to 2 inches of depth in woodworking applications, and approximately 1/2 inch on metal. Some jigsaws may feature a slightly deeper cut, but this isn’t necessarily desirable on a jigsaw, as the deeper the action, the better the chance of the blade bending and breaking. You can have the best jigsaw money can buy, but if you don’t have the right blade you might as well try cutting the material with a butter knife. The blade does all the cutting and therefore knowing what blade to use for what material you are cutting is very important. Wood: For cutting through thick woods, choose a jigsaw blade with large, sharp teeth that are widely spaced. To make finer cuts, look for a blade with smaller teeth that are closer together. Plastic: When cutting plastic, look for a multipurpose blade labeled for plastic cutting. This blade will allow you to cut through the material without melting or chipping the material. Metal: To cut through a tough material like metal, choose a bi-metal jigsaw blade labeled for metal cutting. This will provide the necessary strength. Also look for a blade with precision-ground teeth that are spaced tightly together. We’d recommend Bosch blades. They are the best jigsaw blades in the industry. Dewalt’s jigsaw blades are also a good choice. Look for a jigsaw that has a tool-free blade changing system. Some models require the user to use a tool to change the blade, but this can become a hassle. Most jig saws have a tool-free blade changing system that will hold the blade in the arm no matter how much pressure you put on the tool when using it. Of all the jigsaws we’ve used, the DEWALT DCS331 20-Volt Cordless Jigsaw has the best blade changing system. It’s very quick, easy and secure. Most jigsaws have adjustable shoes that allow you to angle the saw for bevel cuts, but the best jigsaws will have preset stops at the common angles, such as 0, 15, 30, and 45 degrees. Avoid a jigsaw with a stamped aluminum shoe; better jigsaws have cast steel bases. Some recent jigsaw models come with a laser guideline that casts a thin red cutting line out from the front of the saw, similar to the laser lines often found on modern circular saws. This can be a helpful feature for maintaining a straight cutting line with a jigsaw, which is naturally prone to twisting as you try to follow a straight line. Dual-bevel capability allows angled cuts in either direction without flipping the workpiece. Anti-vibration features reduce wear on your hands and enhance precision. Dust collection ports clean sawdust as you go, and dust blowers clear away sawdust so you can see the cut line more easily. Built-in lights enhance visibility without work lights. Choosing the best jigsaw or cordless jigsaw is not difficult. Always take into consideration the above factors before buying a jig saw. You should aim to buy a product that meet your project or task requirement and most importantly is the safety aspect of the tool. We hope our jig saw reviews and buying guide will help you find the right jigsaw that you’ll love to work with.